Last year, Kellyanne Conway caused a media stir when she fabricated the Bowling Green massacre in order to drum up support for Trump’s travel ban. The media rightly called her on her bluff, but few bothered to note the double insult: in the 17th century, there really had been a Bowling Green massacre—this one perpetrated by white colonists. But because the victims had been indigenous, the massacre was deemed unimportant by most historians, and did not make it into the annals of cultural—or media—memory. But the massacre was a travesty, and one of the pivots that led toward the establishment of the United States and the near total eradication of Native Americans from the Northeast. The story of the Bowling Green massacre cannot be properly told without a history of colonialism and its attendant concepts of commerce and property. In 1524, the Florentine navigator Giovanni de Verrazzano chanced upon the Upper Bay south of what is now Manhattan and made brief contact with the dozen-odd indigenous groups in the area who called themselves the Lenape. No sooner had he sailed on then the area was inundated with fur traders looking for valuable beaver pelts. The Lenape had inhabited the region for thousands of years, cultivating beans, maize and squash and traveling between seasonal campsites, but the allure of the white man’s goods proved a powerful temptation, and as the Lenape focused more and more on trapping beavers they began to neglect their own food stores—sending their people to the brink of famine. As they swapped stalking game for more permanent trapping settlements, the beaver population was obliterated inter-tribal warfare increased, kinship networks weakened, and bands dissolved and regrouped in an effort to maintain a semblance of stability. By the time the Lenape registered the consequences of this shift in economic, political and social life, they were already trapped in a vicious cycle of dependency on their white enemies. Meanwhile, the colonists were busy turning the the mid-Atlantic seaboard into a ruthless business empire. Unlike the classic American story of pilgrims seeking religious freedom, most of the thirteen original colonies were just that—massive extraction industries run by greedy politician-financiers. In 1624, the West India Company—an owner or investor spelled out the consequences of this setup in a set of Provisional Orders. In case there was any confusion about company values, the Ordres mandated that the colonies be run as a series of factories in which the company’s interest came first, the company made the rules, and demanded total fealty from the colonists, dictating everything from the laws they had to follow to where they could live. The difference between white and indigenous approaches to land and commerce—combined with the Lenape’ newfound economic dependency—set the two groups on a collision course that would lead to massacre and, eventually, annihilation. In 1626, West India Company director Minuit set things in motion when he “purchased” what is now Manhattan from the Lenape for sixty guilders of trade goods. The concept of purchase was, of course, foreign to the Lenape, who could not have known what they were giving up. Emboldened, the top dogs at the WIC began to purchase huge tracts of land in what is now Brooklyn, Queens, the Bronx and New Jersey. 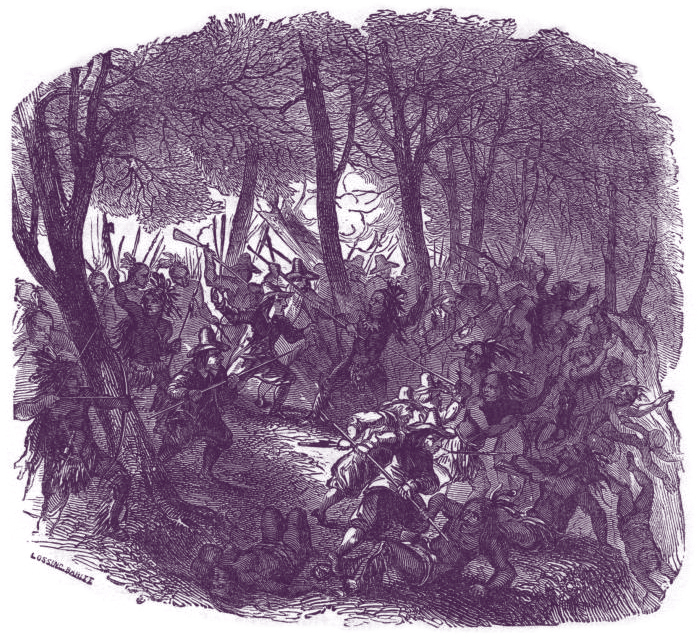 Then, in a turn that would be ironic if it weren’t so base, company man Klieft demanded “contributions” of food, furs, and goods from the Lenape in exchange for his “protection.” When angry indigenous groups refused and resisted, he retaliated, sending 80 soldiers to teach them a lesson and torturing captured indigenous warriors. After Mahicans—adversaries to the native groups of the Hudson Valley—attacked groups living north of Manhattan, over 1000 refugees sought protection from the Dutch. But instead of protection, they opted for massacre, slaughtering scores of Wickquasgeck and Hackensack men, women, and children, hacking and torturing infants to death, and leaving the survivors to stumble back to their enemies with their entrails in their hands. This—not Conway’s paranoid fabrication—is the real Bowling Green Massacre, and the fallout set the stage for the total destruction of the Lenape and the eventual eradication of the indigenous people of the Eastern Seaboard. When the final Lenape man died in Canarsie in 1803, his people, his culture, and the memory of the violence they suffered largely went with him. Standing in Bowling Green park today, there is no hint of the slaughter that occurred there, but the United States continues to pit commerce and white supremacy against people of color in order to gain or maintain power. To fight this erasure, we need to stop allowing the fabrication of violent massacres and start unearthing and sharing the memory of real ones. Learn more about the the real Bowling Green Massacre on our People's History of Lower Manhattan Tour.